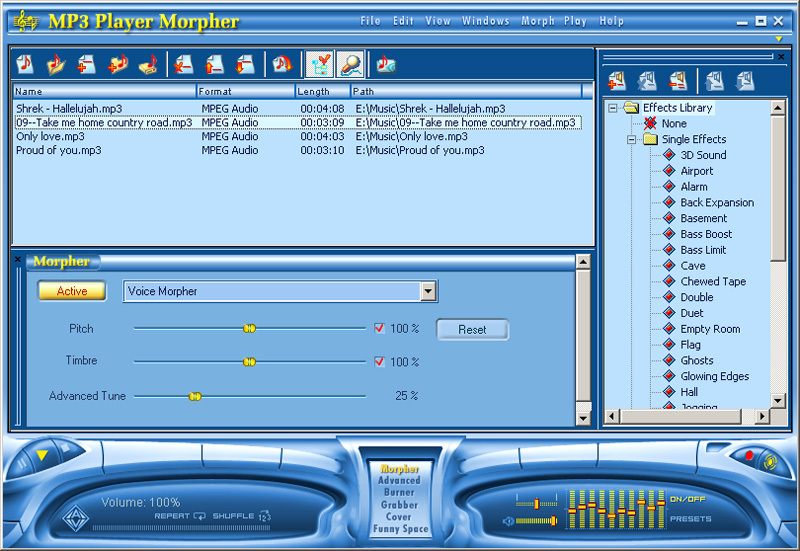 Free Download AV MP3 Player - Morpher 4.0.100 - Play, morph, mix, record, burn voice & music. AV MP3 Player Morpher is a free MP3 player to play, modify and edit music. You can modify your favorite song by changing its tempo, adding cool sound effects and beats, and even morphing singer's voice from male to female. It plays multi-format audio, records sound, converts between popular music file formats, rips and burns CDs, creates CD covers. AV MP3 Player Morpher support many popular audio formats including MP3, WAV, OGG, APE, AIF, IRC, NIST, AU, and more. AV MP3 Player Morpher can be used as an all-in-one music studio for home DJ's providing all necessary functions in separate modules. The Morpher module designed as a player is a powerful tool to change voice in your favorite songs by adjusting the Pitch and Timbre values (Voice Morpher), adding beats, bongo and drum loops (Beat Tracking), changing the tempo (Tempo Morpher), creating Cher or Robot voice effect, changing frequency, adding single and advanced effects from its audio effects library in real time. The integrated audio converter converts audio formats from WMA to MP3, MP3 to WAV, or between any of the supported formats such as OGG, APE, AIF, IRC, NIST, AU, and others. The built-in MP3 Grabber will rip audio tracks from CDs to your hard disk in any supported format. It allows to edit ID3 tag information about the artist and the album for the grabbed audio tracks. AV Organizer is here to work with playlists and to manage your digital music collection with its tagging, sorting and searching functions. AV Funny Space module allows to download numerous audio and video files from the designer's website. AV MP3 Player Morpher has all the tools ready to create your own CD: Recorder, Burner, Cover Editor. Record your voice while singing into your microphone and save the recording to a file of any supported audio format (MP3, WMA, WAV, or other), then burn it to a CD. The built-in cover editor will help you create a personalized cover for your CD. You can easily share it with your friends or relatives. Download the free trial version of AV MP3 Player Morpher now! Review AV MP3 Player - Morpher!